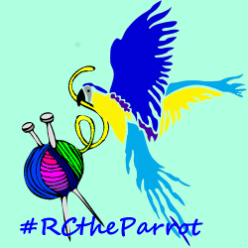 As you will already know, if you have either visited my website or read the #RCtheParrot section of this blog, I am a relative newbie to the world of knitting and crochet. Early learning of basic skills saw me leap in to various projects over the years and leap back out again as soon as they were completed. Thus it is that in the summer of 2015, I have a small and simple repertoire but I have been told that what I make is well done – starting with knitting 4-ply wool socks, I now can knit or crochet small cardigans/jumpers, crochet motifs and flowers, knit cotton breast-protheses and, from other blogs and videos online continue to learn new skills. Without the events of 2006, I doubt I would have ever known what entrelac, mitre, and frogging all mean! Knitting or crocheting for charities or charity events is a brilliant way for those of us who are mostly at home to keep ourselves well engaged with the outside world. The rewards I have found from making items for a world record yarnbomb at a children’s hospice in 2014, for a Woollen Woods event in Derbyshire this year, for Knit for Peace, for KnittedKnockersUK are beyond anything anyone could have done for me. These small items, which I choose to make, put me back in control, just a bit, of my life and, as an added bonus, helps others… truly a win/win!